A timeline to start this out: TimeformUS Early and Late Ratings have been a popular part of TimeformUS Past Performances since December 2013 because they give users an easy-to-use snapshot of a horse’s early and late speed. As part of our partnership with Daily Racing Form, the TFUS Early and Late Ratings were introduced to print versions of Daily Racing Form (DRF) Past Performances in April of 2017. In December of 2017, these ratings were added to the popular DRF Formulator product. Notably, the TimeformUS Pace Figures and Final Time Figures were also added to Formulator at that time. As a result of these additions, a lot of questions have emerged from Formulator customers who are looking to understand when to lean on the Early/Late Ratings and when to lean on Pace Figures. This piece looks to answer those questions. Let’s explore. Most of the questions revolve around the scale of the Early and Late Ratings and how they relate to the TimeformUS Pace and Final Time Figures. The average winning final-time figure for a Grade 1 (G1) race for older males hovers around 130. The average remains fairly consistent for the pace figures regardless of surface and distance. This is done intentionally. The TimeformUS Pace and Final Time Figures are designed to tell a story about the pace of each individual race and how it may have influenced the outcome. It is easy to see at a glance if a race had a fast pace that may have aided off-the-pace runners or if the pace was slow and may have aided those running at the front of the field. The Pace Figures, however, are not designed to be compared across different surfaces and distances. For example, with all else being equal, a 23-second opening quarter mile in a dirt sprint will receive a lower pace figure than the same time would for the opening quarter of a turf route even though they are the same exact raw speed. After all, a dirt sprinter is expected to go faster early while a turf router is expected to go slower. The Early Ratings are the foundation of the TimeformUS Pace Projector. 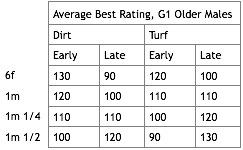 They identify which horses are likely to contest the pace. The Late Ratings attempt to indicate which horses will be finishing fastest through the stretch. As mentioned earlier, G1 older males average ~130 on TimeformUS Pace and Final Time Figures. This does not hold true for Early and Late Ratings. Horses change distance and surface often in horse racing. We need to be able to compare horses from these various conditions from a pace perspective. The following is a very rough guide to what you can expect the ratings to be for various surface and distance combinations for G1 older males. Horse A sets the pace in a 6f dirt race and earns a 130 TimeformUS Pace Figure. Horse B sets the pace in a one-mile turf race and also earns a 130 pace figure for the effort. If they faced off in the same race next time out, Horse A would show a TimeformUS Early Rating of 130, while Horse B would show only a 110. Comments: Think of this in human terms, with the typical TFUS customer doing the running. If the typical TFUS customer were hellbent on taking the early lead in the Boston Marathon, he might be able to do it, since the early pace in a marathon is typically set by a runner who is pacing himself so that he can run 26 miles in the fastest possible time. Of course the TFUS customer would then collapse 25.5 miles short of the finish line, but he could earn a fast pace figure before he gets a DNF and a trip to the hospital. Now imagine this same TFUS customer trying to take the early lead in a one-mile race composed of top milers. Lots of luck. He would get dusted from the opening gun. Horse A closes from dead last to win a 6f dirt race rated at 130. Horse B closes from dead last to win a 1m 1/4 turf race that was also rated a 130. In the unlikely scenario that these horses raced against each other next time out, Horse A’s late rating would check in at only 90 while Horse B would show a 120. Comments: The reason for this is that dirt sprints and turf routes tend to unfold in vastly dissimilar ways. The most stressful part of sprints tends to be the early part. That is where knockout punches are so often thrown. In turf routes, on the other hand, the decisive action tends to happen late. The upshot of this is that being a strong closer in a dirt sprint and being a strong closer in a turf route are two different things. The best closer in a dirt sprint might well be the only genuine closer in the entire field. The best closer in a turf route, on the other hand, is very often the best closer among many strong closers. We make our Early Pace and Late Pace ratings in a manner that reflects the fundamental differences between various sorts of races. And of course we monitor the performances of horses who move between sprints and routes, dirt and turf, etc., in order to ensure that our theories are being matched by the performances of the horses in real life. The TimeformUS Early and Late Ratings are much more complex than the simplistic chart and scenarios above suggest. An early and late rating for each race is created based on the pace figures, the horse’s running style in each race, the distance of the race, and the surface of the race. These individual race ratings are not shown in the past performances. Multiple races are then combined to form the overall number that is displayed in past performances. When handicapping using the various TimeformUS ratings and figures, remember the goal behind each of them. Don’t overthink the ratings or try to assign meanings to them that were never intended. The TimeformUS Pace and Final Time Figures tell a story about a past race from a pace perspective. They help indicate which horses were favored and which were hampered by the pace of a particular race. The final-time figure is a good indicator of overall ability. The TimeformUS Early and Late Ratings facilitate horse-to-horse comparisons of early and late speed for an upcoming race. They are best used for predicting the likely pace scenario of upcoming races and predicting which horses may benefit and which might struggle. A side note: While Formulator includes the data elements described above, a comprehensive selection of figures and ratings is available exclusively in TimeformUS PPs. Pace Projectors, derived from the Early/Late Ratings, live in TimeformUS PPs. Our Final Time Speed Figures are adjusted for pace exclusively in TimeformUS PPs, too, creating TimeformUS Speed Figures. Finally, we offer Adjusted Fractions in TimeformUS PPs. 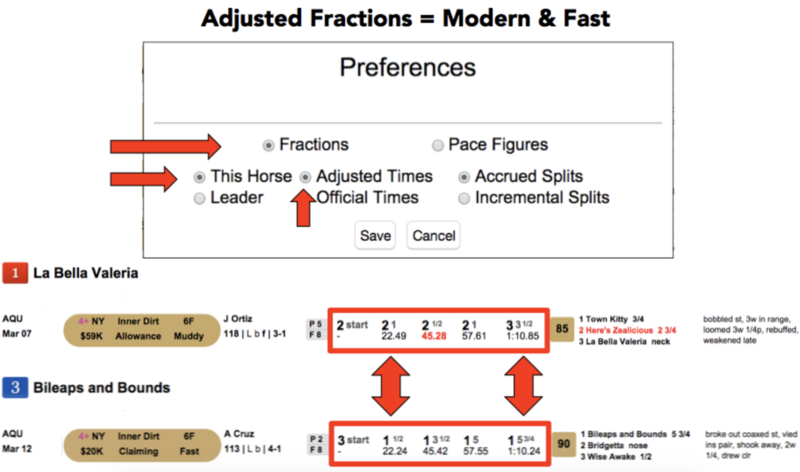 Here’s how Adjusted Fractions work: We adjust each horses fractional times based on the speed and configuration of the racetrack. Official fractions account for neither, so you’re left with the same problem you would have if you used raw final times without also using speed figures to help assess them. Smart horseplayers know that track speed changes. This is why TimeformUS offers, and prefers, adjusted fractions over official fractions. 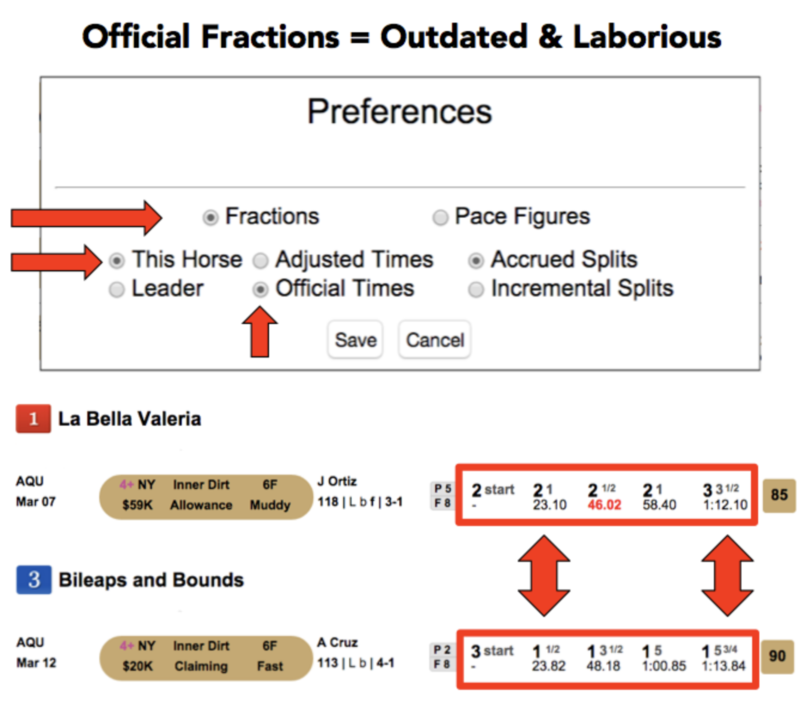 By clicking on any horse’s running line in TimeformUS PPs, you can set your preferences for how TimeformUS displays race fractions on the screen. If I am correct the early and late Ratings are for the race they are entered in that day and change every time they are re-enter for a specific race ? Ok, could you give us an example of what you just said Craig? Pace figures are determined by what is the normal fraction the winning horse runs at each point for races for today’s winning final time. If expected quarter mile for a certain final time is 22 and leader runs 23, race will get a lower pace figure than 100, much lower. If the horse runs 21 it will get a much higher pace figure than 100. I don’t feel that there is enough information to provide pars the way racing is currently structured. There are too many conditions spread over too many distance and surface combinations to come up with any kind of par that I’d have confidence in. In essence, we are using the final time figure for the race as the par for the race and comparing the pace figures to that.